There are many things you can do to prepare for your Great Run. You can buy the right shoes, test out your running kit beforehand, make sure your diet is in order and that you have trained sufficiently well to make it round the course. But some things are unpredictable and out of your control. Among these is the weather and what it will throw at you on the day. I’ve run many marathons, half marathons and 10ks and, along with my team of sport scientists, have researched how the weather affects performance in these and other running events. Our research at St Mary’s University, Twickenham in London, has shown that a temperature of around 8-10 degrees is perfect for distance running. It’s warm enough to allow the muscles to function well, but not so hot that it creates a high risk of dehydration. I recommend checking the weather forecast regularly in the days before your big run. Remember you are not just checking to see what the weather is like up to the start of the event, but for any changes that may occur whilst you are out running. Don’t forget you could be on course for a while and the British climate is notoriously changeable, so be as prepared as you can. If it’s hot, drink more the day before, set off slowly and make use of the on-course drinks. If it’s cold, you won’t need to drink as much as your body will be producing less sweat (its internal cooling mechanism), but don’t neglect fluids. A lot of people make the mistake of thinking they don’t sweat at all when it’s cold, but you’d be surprised and failing to prepare can be disastrous. 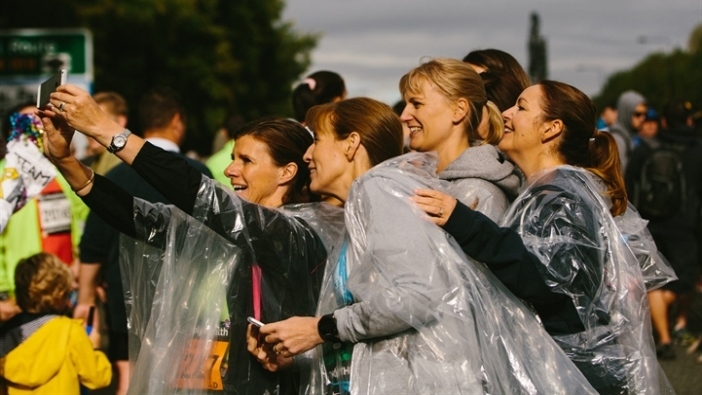 Make sure you are well wrapped up beforehand and wear a protective layer that can be discarded on the start line, such as an old t-shirt, but don’t be tempted to wear too much during the run itself. You will quickly warm up. Every movement a runner makes produces heat, which we lose by sweating. Our studies have shown it’s easier to run in cold conditions than warm, partly because it’s less effort for the body to stay cool. In tests conducted in our labs, we recreated a typical winter’s UK day and a typical summer’s day. We found that runners’ heart rates were about 6% higher in the hotter conditions and that they dehydrated by around 30-38% more in those hotter conditions over a 10k distance. They also reported running in the cooler conditions to be around 30% easier. Running can seem like harder work when it’s very hot, so you may need to adjust your overall goal. Increase your fluid intake, but not excessively. And don’t set off too fast. Remember your SPF application as sunburn can be an issue. For those who have a surplus of body hair, a trim of the chest can help to cool your body, too. Heavy rain can make running a little more challenging, so wear the right clothing to minimise the discomfort. Choose high tech, lightweight specialist running fabrics over cotton which will retain moisture and can contribute to chafing. On the plus side, rain can be cooling when you run, making it seem less like hard work. Whatever the weather, enjoy the experience!